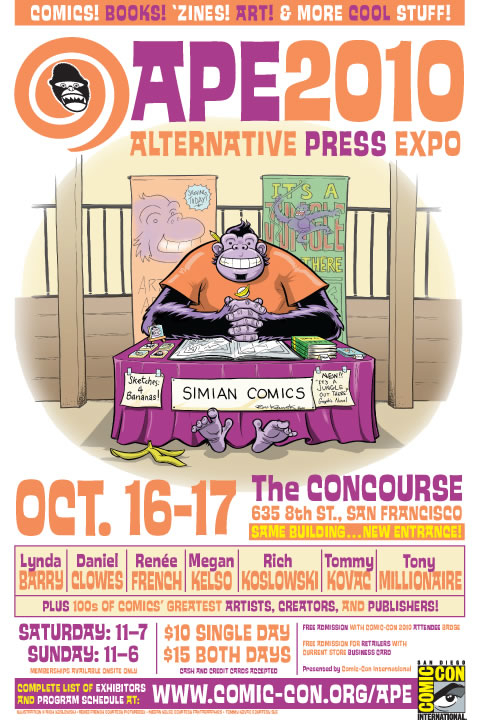 Comic-Con International presents APE 2010 (Alternative Press Expo), an independent publishing and comics conference that takes place October 16-17 at the Concourse Exhibition Center in San Francisco. Alternative Press Expo (APE), the country’s largest alternative and independent comics convention, is part of Comic-Con International (CCI), a nonprofit educational organization dedicated to creating awareness of, and appreciation for, comics and related popular art forms. The organization achieves its mission primarily through the presentation of conventions and events that celebrate the historic and ongoing contribution of comics to art and culture.